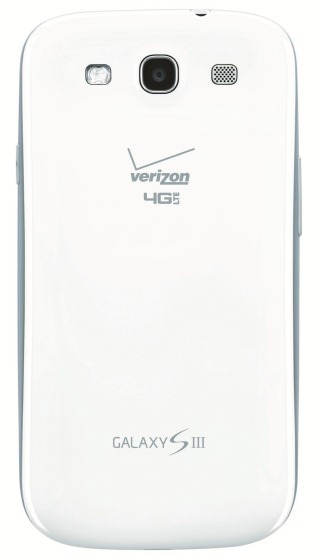 Good news, the long-awaited Android 4.3 update for the Galaxy S III is now rolling out to Verizon customers. Sure, it comes after peers received the goodies first on AT&T, T-Mobile, and Sprint, but that's just the way the wind blows sometimes. Oftentimes, actually. 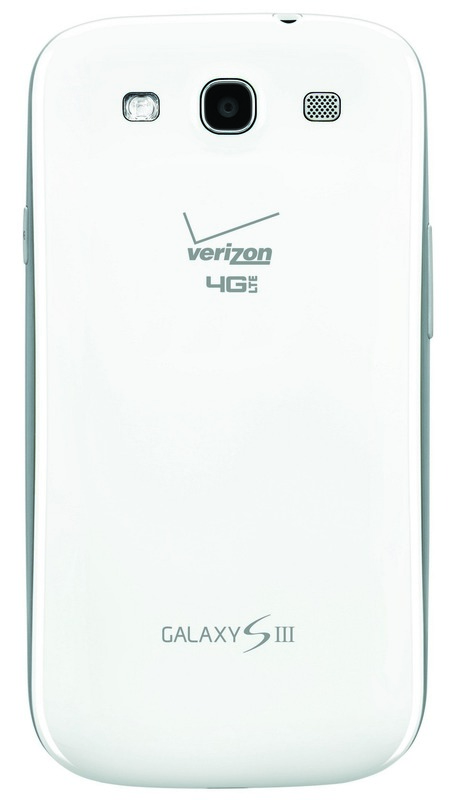 This is Verizon we're talking about. 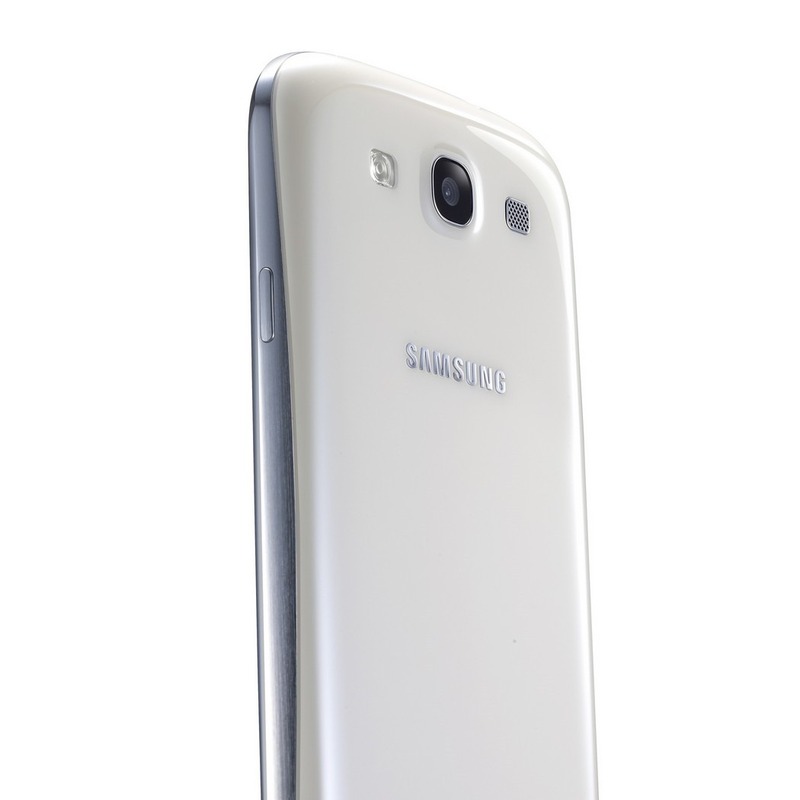 But here it is, build number I535VRUCML1, complete with the last Jelly Bean release and Galaxy Gear compatibility. 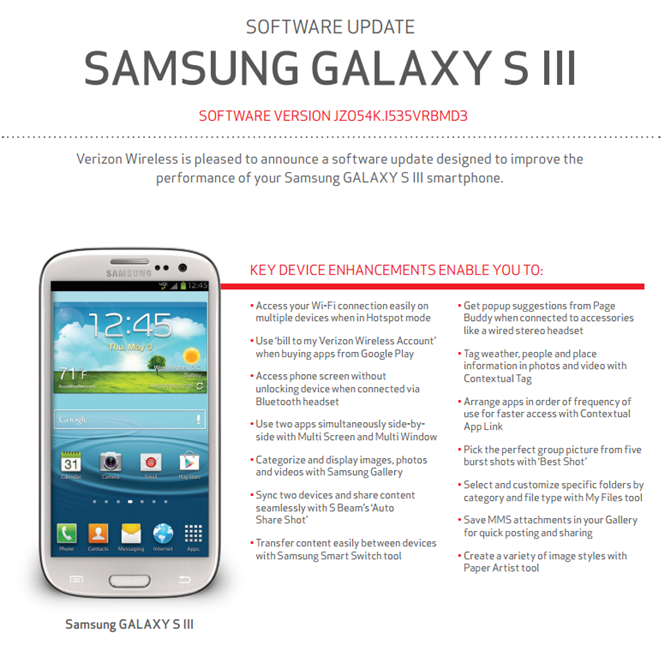 Verizon may not be the fastest carrier when it comes to sending out over-the-air updates, but it looks like it's finally getting around to pushing a fairly sizable 129.1MB update to its version of the Galaxy S III. The OTA brings many small improvements, as well as a slew of Samsung-specific customizations along for the ride. Generally speaking, once Verizon updates its support page, updates tend to start rolling out within a few days (if they haven't already). 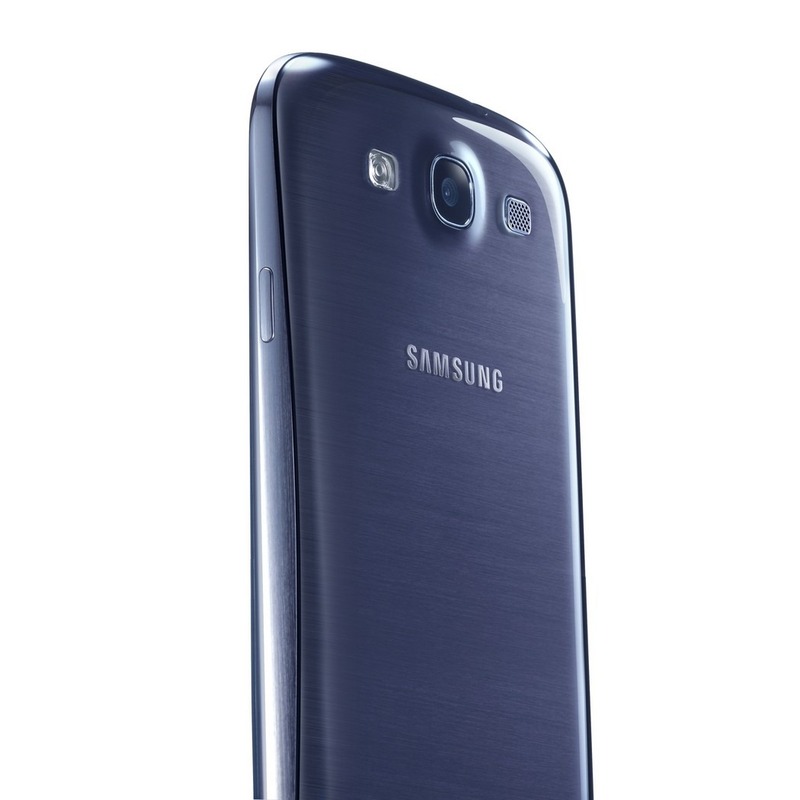 The Galaxy S IV is coming. 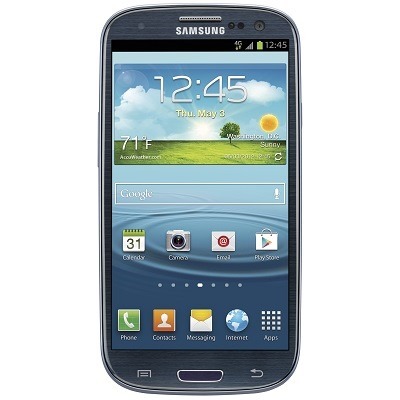 As such, vendors who bought a huge backstock of Galaxy S IIIs need to clear 'em out and make some room. 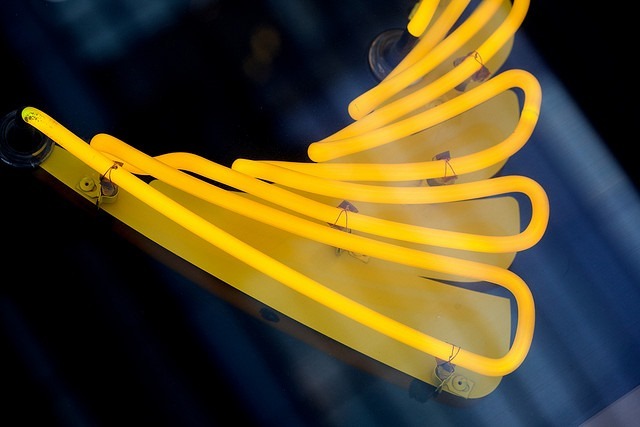 That can only mean one thing: lower prices. 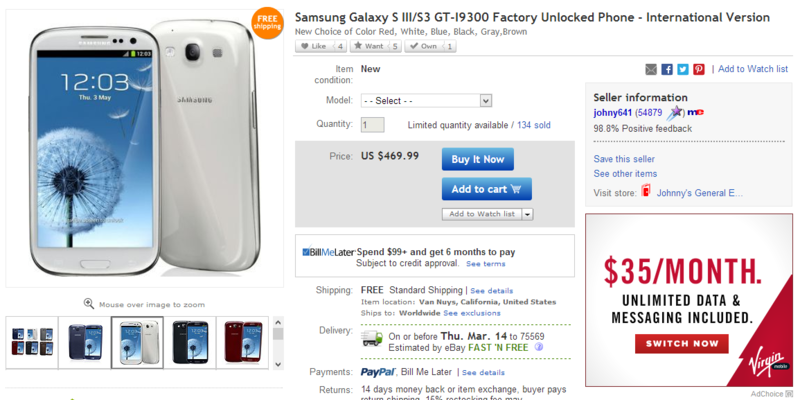 Today, you can get a brand-new, factory unlocked Galaxy S III (GT-i9300) for $470. No contracts. No carrier crap. 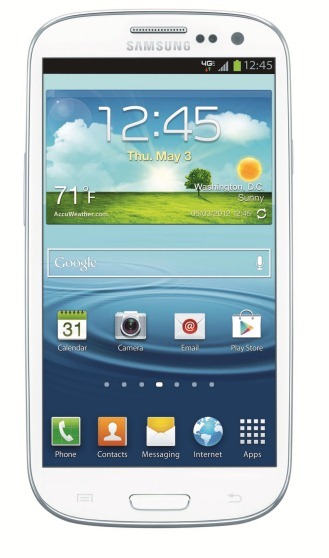 Just a phone that you can activate on any compatible GSM carrier. 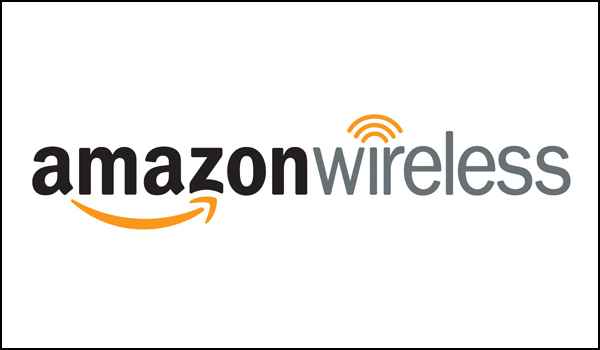 If you're convinced that LTE is the way to go and aren't interested in picking up the Nexus 4, then Amazon Wireless is running a couple of deals right now for those who have been considering making the jump the Sprint. 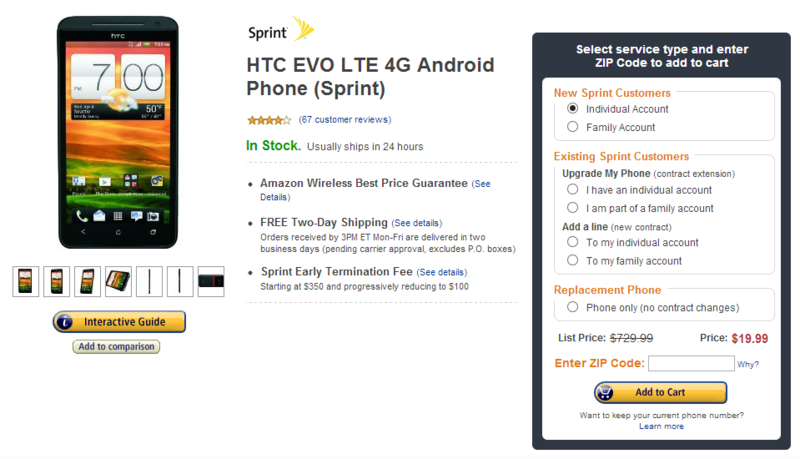 First off, the HTC EVO LTE is now only $20. Twenty. Not a bad deal for such a solid phone, especially if you plan on installing CyanogenMod 10 on it. 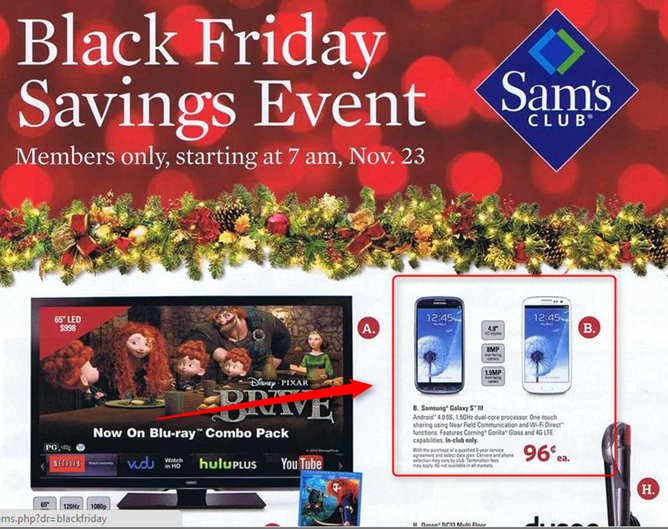 Ah, Black Friday. The biggest (and most malevolent) shopping day of the year. A day of good deals, hateful people, and... other stuff. 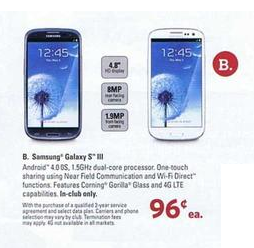 If you're willing to brave the all that for a new phone, Sam's Club has you covered this year, with the Galaxy S III going for less than a buck with a new two-year agreement. From what we gathered by calling a few different Sam's stores, this is good for all four carriers (so long as your local Sam's has them all). 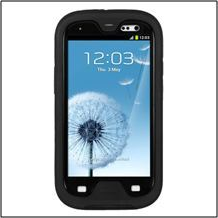 If you own a Galaxy S III and cringe at the thought of losing your beloved device in such a manner, there's hope: the new OBEX case from Seidio. 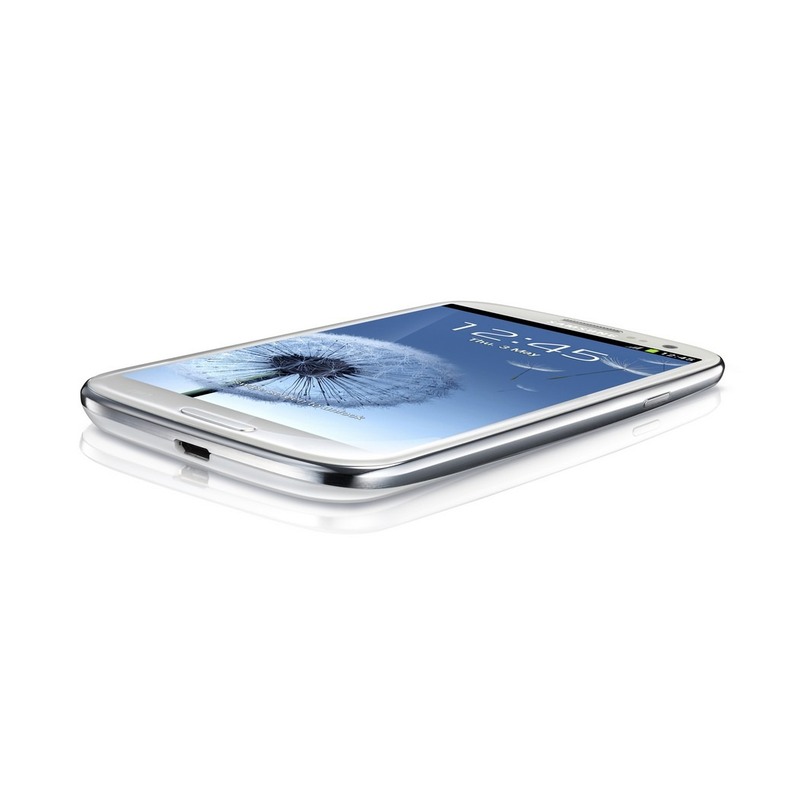 Well, you already know it's not Jelly Bean, but T-Mo is sending an OTA update to the Galaxy S III right now. It's a minor one, mostly dealing with some Touchwiz stuff you likely don't use, as well as a behind-the-scenes tweak to pinch and zoom. Woo. The 12MB update is available via OTA right now, but if you'd rather use Kies for some weird reason, you'll have to wait until tomorrow. 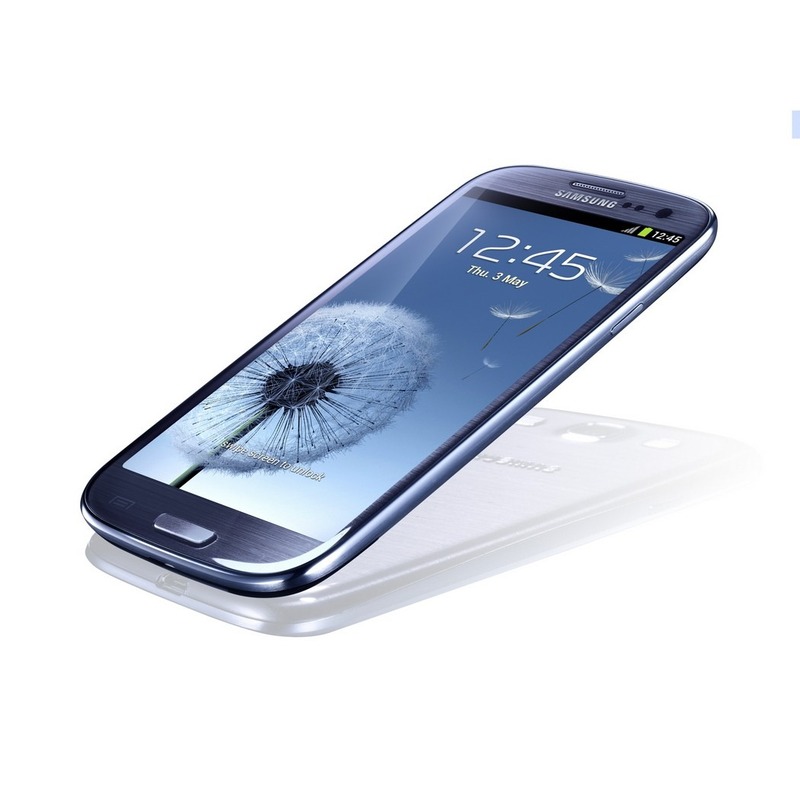 The specific timing and update method will be announced by each carrier partner, AT&T, Sprint, T-Mobile, Verizon Wireless and U.S.
Last night, Samsung announced that the Galaxy S III would be available on five different U.S. carriers: Verizon, AT&T, T-Mobile, Sprint, and U.S. Cellular. Each carrier's individual PRs have already begun rolling in, so we're starting to get an idea of when we can expect this device to hit the states; for Big Red, pre-orders will begin on June 6th promptly at 7 AM EST. Aesthetically, the device doesn't deviate from its international counterpart, and according to these press shots, looks exactly like our leak from last night.